Hypnotize KDubShinehi, does anyone know how to change the colour of the health/ammo pickup animation and the demo sticky counter? thanks[quote=Hypnotize][quote=KDubShine]hi, does anyone know how to change the colour of the health/ammo pickup animation and the demo sticky counter? How do you change the color of the text that shows up in the developer console in sourcescheme.res? Also, how do you make the console, server browser, and other parts of the sourcescheme more transparent? Hey, does anyone know how to add a black outline for the default crosshairs? "fgcolor"		"233 233 233 255"
Is + reserved for something? "fgcolor"	"233 233 233 255"
You've positioned the thing to be 100 wide, but -85 away from the middle of the entity. Meaning that the + is showing up 35 outside of the boundaries of the entity. I set my hudplayerstatus to be f0 tall/wide which takes up the whole screen, so it's the element and not the text that's at c-85. I'm having trouble with sizzling stats with my hud. I'm not able to press continue and exit out of it until I do a hud_reloadscheme. Any ideas? In what file is the winpanel located at ? Artz_HispanianIn what file is the winpanel located at ? [quote=Artz_Hispanian]In what file is the winpanel located at ? Hypnotize Artz_HispanianIn what file is the winpanel located at ? another question which line should i edit to move the entire winpanel around ? [quote=Hypnotize][quote=Artz_Hispanian]In what file is the winpanel located at ? Artz_Hispanian Hypnotize Artz_HispanianIn what file is the winpanel located at ? [quote=Artz_Hispanian][quote=Hypnotize][quote=Artz_Hispanian]In what file is the winpanel located at ? ninjajiroI've been playing MVM recently and I noticed the Giants' healths aren't showing up. What .res file controls their health and how would I add them? [quote=ninjajiro]I've been playing MVM recently and I noticed the Giants' healths aren't showing up. hey, i really like using the wings scout crosshair when using the default "none" crosshair, unfortunatly i don't really like the other crosshairs it brings with it. is it possible to implement a hud crosshair that looks like it with an outline? i am using updated g-mang hud and my res is 1920 x 1080. [s]hey, i really like using the wings scout crosshair when using the default "none" crosshair, unfortunatly i don't really like the other crosshairs it brings with it. is it possible to implement a hud crosshair that looks like it with an outline? 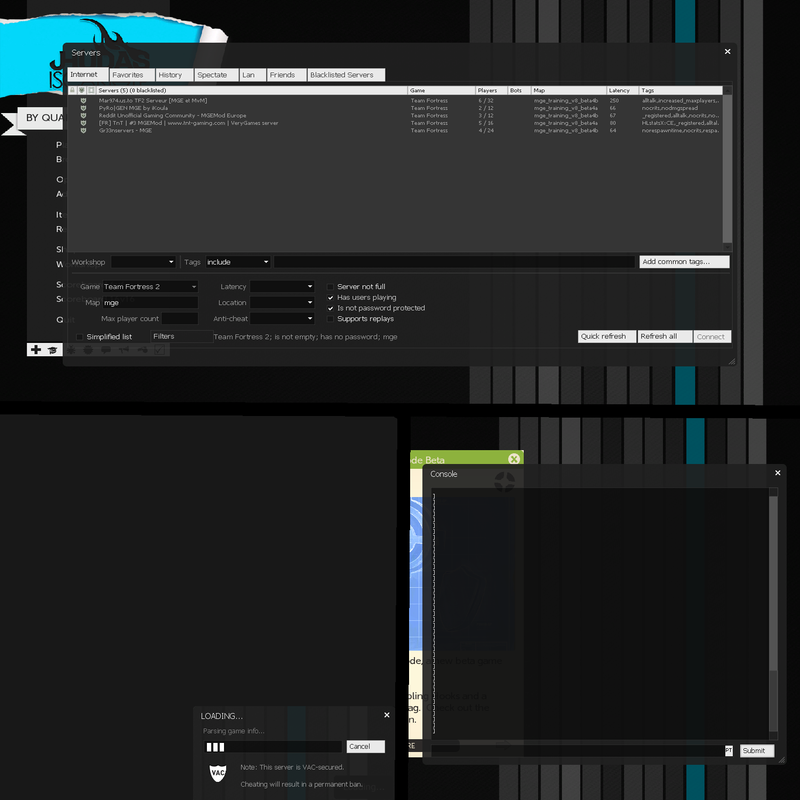 i am using [url=http://steamcommunity.com/groups/Un-officialg-manghud] updated g-mang hud [/url] and my res is 1920 x 1080. I know NOTHING about the HUD playermodels thing in the corner so I was wondering if anyone could just supply me with one that looks like this. Anyone knows how to change the opacity of the console , server browser and the "joining server box"
AleXAnyone knows how to change the opacity of the console , server browser and the "joining server box"
[quote=AleX]Anyone knows how to change the opacity of the console , server browser and the "joining server box"
MubbyI know NOTHING about the HUD playermodels thing in the corner so I was wondering if anyone could just supply me with one that looks like this. You could probably just download any version of yahud and take hudplayerclass.res and copy it into your resource/ui folder. [quote=Mubby]I know NOTHING about the HUD playermodels thing in the corner so I was wondering if anyone could just supply me with one that looks like this. ninjajiro ninjajiroI've been playing MVM recently and I noticed the Giants' healths aren't showing up. bind "=" "toggle tf_hud_target_id_disable_floating_health 0 1"
put that in your autoexec, you can change the = to something else if you want/need. overhead health shows their hp, old target ID does not. [quote=ninjajiro][quote=ninjajiro]I've been playing MVM recently and I noticed the Giants' healths aren't showing up. Xanderqixter ninjajiro ninjajiroI've been playing MVM recently and I noticed the Giants' healths aren't showing up. [quote=Xanderqixter][quote=ninjajiro][quote=ninjajiro]I've been playing MVM recently and I noticed the Giants' healths aren't showing up. is here some kind of grid so i know where it will be? I go by making the xpos and ypos 0 and the zpos to 5 or so, so it'll be in the corner of the container and on top of mostly every other thing inside it. Hi! I'm currently in the process of editing/updating one HUD and sometimes I get stuck on certain stuff. If there's a HUD editor with free time that would be willing to give me instructions when I'm lost, I would be really grateful. I know that there are sites and tutorials about all this stuff, but talking to a real person is much faster and flexible. I am using the newest version of Slinfire HUD, which I downloaded from his stream. 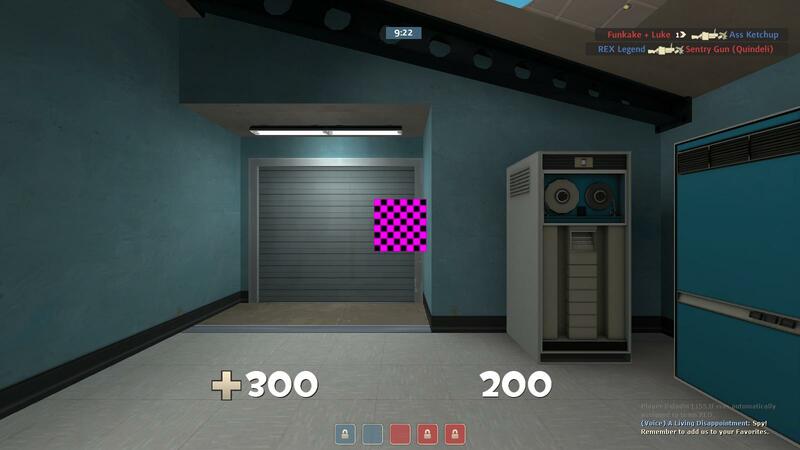 When I play heavy, I get the missing texture boxes where my crosshair should be. I have poked around for a bit, but nothing seems out of place. I just installed KBNhud and was trying to get the hud circle to align. When I edit the file by adjusting the numbers (c-101 to c-99), though, the circle disappears and I can't get it back. All I've edited was the xpos and ypos. "fgcolor"	"Damage Circle base color"
are you by any chance on a mac @1318?